← Is the foreclosure crisis over in WNC? The arts have long been a vehicle for progressive thinkers to communicate ideas, challenge beliefs or expose injustices. Here’s a quick look at three artists exploring this overlap between arts and activism. Letterpress printer Frank Brannon directs a printing project that uses the Cherokee language. “Like many languages around the world, the Cherokee spoken language is struggling to continue as there are fewer and fewer speakers,” Brannon says. His academic research focused on the historical 19th-century newspaper, the Cherokee Phoenix, which was printed in both English and Cherokee. When speaking about her work, sculptor Annie Lemanski says, “Even though I’m making animals a lot of the time, it has to do with human activity. It’s about our relationship with animals and our exploitation of them.” In one piece, Lemanski created a sculpture of a lion head, exploring the issue of some African herders protecting their livestock by using pesticides on animal carcasses, to poison the lions that feed on them. “I’m not solely on the side of the animal or solely on the side of the human,” Lemanski says. “I’m just trying to point out things that I see happening and make people aware of it.” The piece “Deregulator” is in the Asheville Art Museum’s permanent collection. 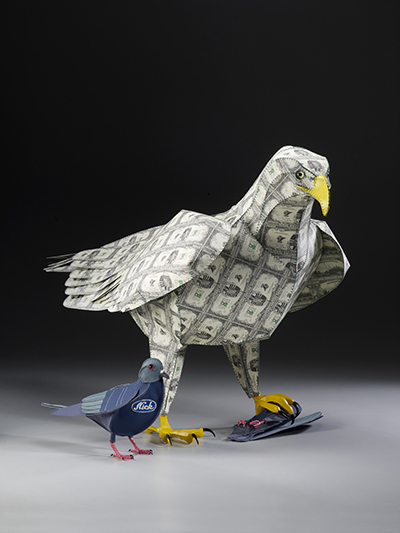 Addressing the 2008 financial crisis, Lemanski used imitation billion dollar bills to form the eagle, which Lemanski describes as “the national symbol.” The pigeons of the sculpture are then outfitted as “blue-collar mechanics and factory workers.” Of note is the smashed “Joe Pigeon” in the eagle’s left claw. In 1990, ceramic artist John Hartom started the Empty Bowls project with his wife, Lisa Blackburn. What began as a one-time project to address hunger continues today in communities around the world. Empty Bowls event attendees receive a handmade ceramic bowl and a humble meal of soup and bread. For more information on these projects, visit www.speakeasypress.com, www.emptybowls.net and www.annelemanski.com. The next Empty Bowls event in our region is scheduled for July 27 in Black Mountain.